Met Gus today on BART: a serious bicycle commuter. He bikes to work everyday from San Leandro to Walnut Creek. That's 46 miles roundtrip. He says he uses BART to save money on gas. For cyclists, riding BART also dramatically cuts the travel time and avoids the freeway which is the only direct way to get between the two points. Still, he estimates he bikes 12 miles of it everyday, 6 in and 6 out. The IRS assumes that the total cost to operate a car (including gas, insurance, licensing, etc.) is $0.505 cents/mile. For Gus, that means $23.23/day if he drives and $7.80/day if he uses BART and bike. Given these estimates, he's saving $15.43/day by using bike and BART. The cost of bike maintenance is not included here but given that a lot of employers will offset travel costs for use of public transportation, the actual savings for a lot of people is probably this good or better. The Caldecott tunnel sits between the two cities and is jammed in both directions during commute hours. Google maps estimates 35 minutes as the travel time by car between downtown San Leandro and downtown Walnut Creek on a good day. BART estimates 37 minutes as the travel time by BART over the same distance. This is probably due to the fact that there's no direct BART line between the two towns. BART's sparse and inconsistent arrival times ensure that any transfer adds a lot to the travel time. Travel times improve dramatically on direct lines. This would seem to imply a tie between the two methods regarding travel times. However, traffic snarls are a lot more frequent than BART delays so the 35 minute car travel estimate seems ambitious. The BART travel times, despite, the inconsistent arrival times are more consistent than the car arrival times. Regardless how the time comparison works out, the ride time is comparable. What's more, the ride itself provides added value by allowing you to do something else (texting, talking, reading, etc.) while you get to work. Doing that in a car will get you into an accident or thrown in jail. 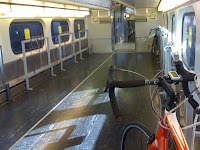 For cyclists in particular, BART also provides added value by whisking you past the least safe bits of road (freeways). This saves your ear drums and your life. Gus demonstrates how combining a bike with BART or Caltrain can be a potent combination in a daily commute. One thing to note about BART, however, is that it needs to catch up to CalTrain on bike support. Caltrain almost always has a dedicated bike car on its trains going in and out of its busiest destination: San Francisco. Consequently, CalTrain does not restrict when bikes are welcome on the train. BART, on the other hand, has no bike car and has a lot of vague rules that make using a bike really unpredictable at the most popular parts of the line and the most popular times of the day. For instance, BART has a "bike curfew" through the downtown San Francisco corridor during rush hour even though this, of course, is exactly when you want the most people on their bikes. The list of dodgy rules for bikes on BART can be found here. Luckily, in Gus' part of town, the BART rules are not a factor.